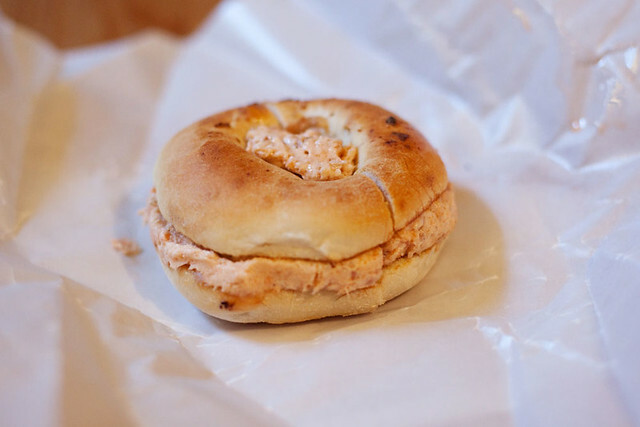 The baked salmon salad in a toasted bagel at Shelsky’s Smoked Fish in Carroll Gardens is FREAKIN ADDICTIVE! I had saw my friend’s photo of the thing and for some reason I ran out and got the same thing. I’ve never been to Shelsky’s before until that day and so I didn’t even know how the baked salmon salad will taste. This was so good that I went and got another one the following Saturday. The salmon was pretty much ground up into a paste/spread with seasoning in it. If you love salmon you will love this also. Very strong fish/salmony flavor that might put some people off but I found it quite tasty. It also helped that the toasted bagel was good and warm, crunchy, cool, salmony, UGH I want one now!